April 13th is Nehoiden Day in Needham, a local holiday first declared in 1980 to commemorate the 300th anniversary of the Deed that set aside the land that is now Needham and Wellesley. The holiday also bids us remember the Native Americans who lived here for some 7000 or 8000 years before the English, and the remarkable man who stood with one foot on Indian land, and the other on English land, but who managed to keep his balance anyway. The facts of Nehoiden’s early life are not always clear. We are not even really sure of his name. There are 23 different transcriptions of his name in the state archives, most of them variations of “Hahaton” (as in Nahaton, Nahanton); the sounds of his Algonkian language did not always fit cleanly into English letters. In Dedham records he is “Nehoiden”. He was born sometime around 1635, in the village of Unquity (now Milton). He and is family were converted to Christianity by the Rev. John Eliot in the 1640s, and he took the Christian name of William – William Nehoiden. His family moved to the “Praying Indian” (Christian convert) village at Ponkapoag. 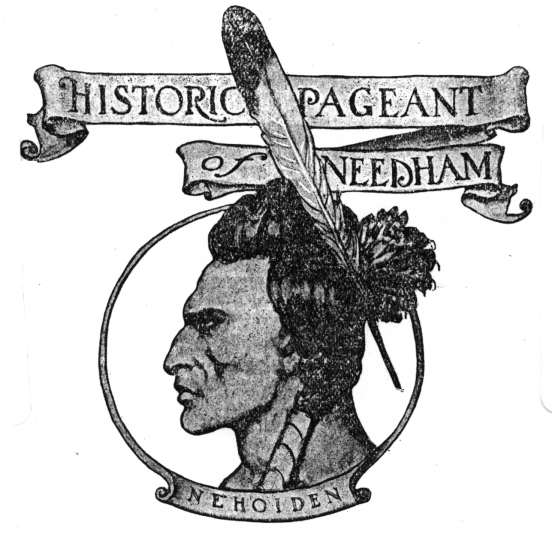 Although he is often known around here as “Chief Nehoiden,” Nehoiden was not a chief. He was, however, one of John Eliot’s assistants and a local leader at Ponkapoag; he was a preacher and schoolmaster there as well. Nehoiden was about as educated a man as was possible in his day, short of attending college to become a minister. He could read and write in English, and later in Algonkian as well. He helped to teach Eliot his own Algonkian language, and to create a written script that they used to translate the Bible. In 1671 Nehoiden was one of three emissaries sent by John Eliot to Metacom (“King Philip”), in a failed effort to defuse the tensions he saw growing between the Indians and the English. When the war came in 1674, Nehoiden led a company of scouts that helped the English to understand Indian methods of warfare. Trusted by neither side, the Praying Indians suffered terribly during King Phillip’s War. The Natick community was interned on Deer Island, left through the winter without adequate food or shelter. Nehoiden was exempted from internment because of the need for his services. Eliot was the only Englishman to protest the internments. Nehoiden and Eliot made several journeys to the island to bring the much-needed supplies, often fighting off settlers who tried to stop them by overturning their boat and dumping their supplies (and them) into the harbor. In the aftermath of King Philip’s War (1675-76), the power of the local tribes was broken, and any remnants of the peaceful collaboration that characterized the initial contacts were swept away. Many of the defeated Native Americans (convert or not) were sold into slavery; many others moved out of the area to live with other tribes. The few remaining gathered into some of the old villages, leaving large parcels of tribal land to be claimed by the growing number of English settlers. To validate these land claims, the government in England required deeds attesting to their purchase. Since he spoke both languages and was known to both the English and the Indians, Nehoiden acted as the negotiator for the deeds for Hingham, Braintree, Walpole, and Dorchester, as well as Dedham. The Dedham Deed, 14 April 1680, records his sale to Dedham of the land that had belonged to his father, north of the Charles River as far as the Upper Falls – the land that would become the Dedham North Parish, and finally, Needham and Wellesley. This was land that belonged to Nehoiden’s family and held the grave of his grandfather, Quaanan. In this Deed, he reserved 40 acres in Hemlock Gorge for himself and his family, fishing land that had belonged to his grandfather. Twenty years later, he sold most the 40 acres to Dedham as well, retaining only the small piece that held Quaanan’s grave. Nehoiden returned to Ponkapaug after the war, gathering together the survivors of the Praying Indian community. He lived there for the remainder of his life, and died in 1717 at the age of about 80. “Nehoiden” – an illustration by N.C. Wyeth for the New Century Club.